But - stand down everyone - Number 10 has insisted the prime minister is not considering calling a general election. 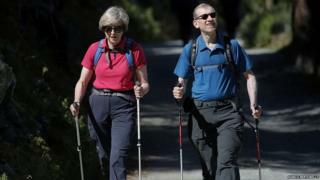 She has previously said she loves going to north Wales with her husband Philip "because the scenery's great". The parliamentary Easter recess comes at a turbulent time in politics, with Brexit deadlocked in Parliament and no resolution - yet - from talks between the government and Labour. Asked whether she was considering another election, her spokesman replied: "No." At the time, she told ITV News she had thought "long and hard" about the matter while relaxing in Snowdonia. Talking more recently about her fondness for north Wales, she said she and Philip "love going there because the scenery's great, the hospitality is great, we get a great welcome there and it's a wonderful part of the country". Ahead of the visit, he said these services play an "absolutely vital role in our communities" but austerity is pushing them "to the brink". Mr Corbyn has previously said Britain is in "limbo" with "deep uncertainly" for businesses and workers over the government's handling of Brexit.